Klikněte na fotografii a zobrazte všechny dostupné fotografie k Liyana Plaza Furnished Apartments. Fitness centrum, Krytý bazén (po celý rok), Kyvadlová doprava (za příplatek), Recepce 24 hodin denně, Služba praní, Rodinné pokoje, Klimatizace. 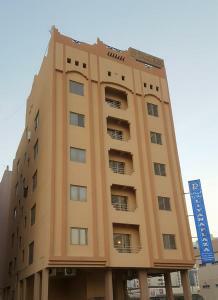 Set in Juffair, Liyana Furnished Apartments features spacious accommodation, a gym and an indoor swimming pool. It is located within a 5-minute drive from Marina Beach and Al Fateh Grand Mosque. All air-conditioned accommodation at Zainal Furnished Apartment offer a simple décor with tiled floors. Each apartment comes with a living room, a dining area and a kitchen. The private bathroom is fitted with a bath or a shower and provides free toiletries. There are several restaurants nearby that provide delivery services. You can enjoy a dip in the indoor swimming pool or work out at the gym. The property offers free valet parking, housekeeping and a 24-hour front desk. Bahrain International Airport is 15 minutes away by car.